Hello again, I am back to post my card for the Sunshine Mail Children and I chose "Happy Fall" because it's such a beautiful time of the year. We had a little of a cool morning here in Mississippi and I thought I could just smell the Autumn air. (Or just wishing for cooler weather maybe. ;) . The colors of the leaves are just breath taking when the change begins. My favorite time of year!! Okay, so here we go! 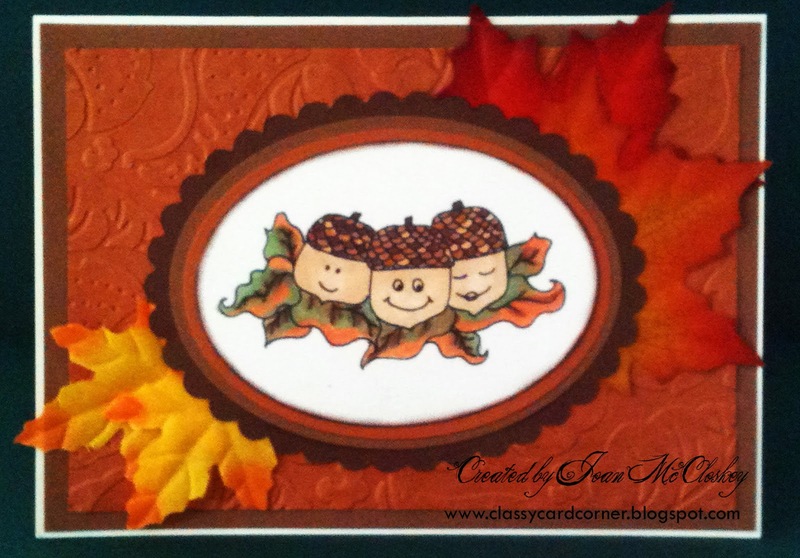 The image is from our generous sponsor Fresh Brewed Designs, called "So Thankful", cutie of an image with the little smiling acorns. The fall leaves are from Michael's. The cardstock is from my stash. 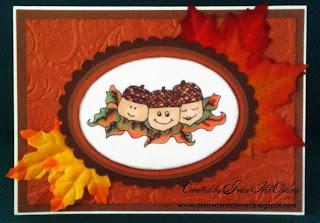 The die cuts are from Spellbinders, Classic Oval and Scalloped Oval. I colored the image with Copics Markers. Well, that completes this post and I hope you have enjoyed your visit and come back often to visit. 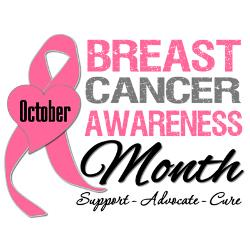 And just a friendly reminder that October is Breast Care Awareness Month! !